"The spirits cannot rest, so why should I?" Order your own copy of The Ebb and Flow at your local retailer or online through our website today! 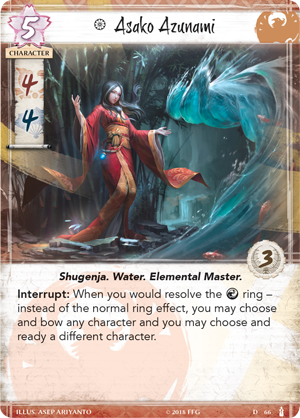 Join us today as we preview The Ebb and Flow, the fourth Dynasty Pack in the Elemental Cycle for Legend of the Five Rings: The Card Game! 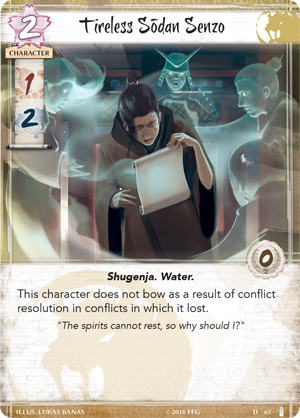 The Ebb and Flow focuses on the element of Water, introducing new Shugenja specializing in this element, including a Phoenix Elemental Master. Also look for a new Crab Province, a holding for the Scorpion, and the infamous leader of the Mantis Clan, Yoritomo. 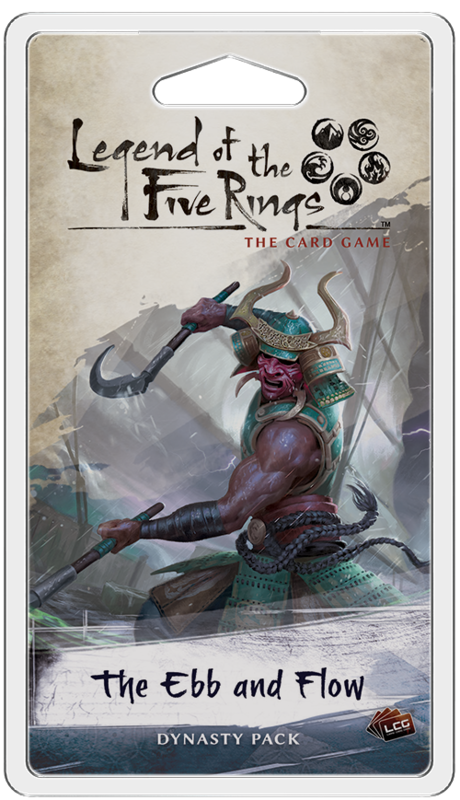 The Water Ring is essential to gaining momentum in a game of Legend of the Five Rings. Whether you're bowing a character with no fate or readying one of your own characters, the benefits of the Water Ring can change the momentum of a turn. 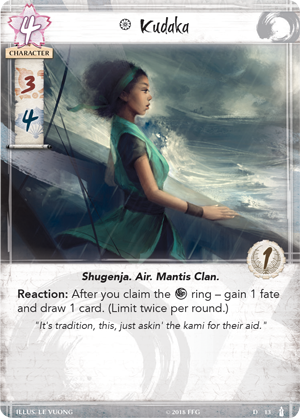 Asako Azunami (The Ebb and Flow, 66) is not just a Shugenja, but an Elemental Master who can unlock the full potential of this ring. When Asako Azunami is on the field, whenever you would resolve the Water ring, instead you may choose and bow any character and ready a different character. This means the Water Ring’s effect is no longer a difficult choice—you are free to use both of its effects, with no fate restrictions on which character you can bow! This kind of power can seriously dampen your opponent’s ability to mount a successful counterattack, as their best characters find themselves unable to join a conflict, and your own characters remain ready for battle. Not to mention Azunami herself holds four military and four political skill, making a huge difference in any conflict she appears in. And with three glory, it is possible Asako Azunami could be the biggest target on the battlefield. Manipulating the Water Ring to unlock its full potential can be a difficult task, but with Asako Azunami, the ability to lock down your opponent is within your grasp. The Lion have a reverence for the history that defines them. As noble warriors, they never forget their ancestors and the sacrifices made in the name of the Emperor. This reverence not only reminds the warriors of who they are, but it can aid them in the conflicts to come. 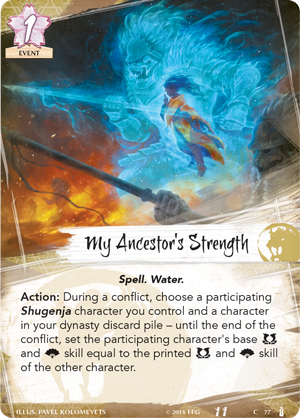 My Ancestor’s Strength (The Ebb and Flow, 77) is a one-fate Spell that allows you to choose a participating Shugenja you control and a character in your dynasty discard pile. Until the end of the conflict, you'll set your Shugenja’s base military and political skill to the printed military and political skill of the other character. This essentially means that the base stats of your Shugenja become equal to those of the character in your discard pile. 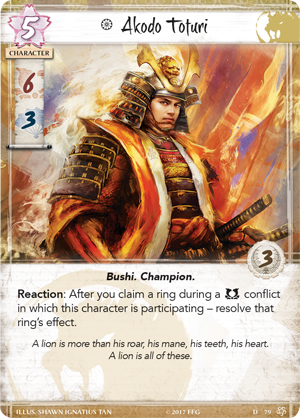 Currently, the Lion don't have the same numbers of Shugenja as some other clans, relying on the Kitsu Spiritcaller (Core Set, 74) for their elemental needs, but the Elemental Cycle offers several new targets for My Ancestor’s Strength, including a new character found in The Ebb and Flow. Even in defeat, the Tireless Sōdan Senzo (The Ebb and Flow, 65) never rests. This Shugenja is always a solid choice to send to a conflict, as he does not bow after the conflict if you lost the struggle. While this is convenient, his one military skill and two political skill may not make the biggest difference in your battles. However, with the Strength of his Ancestors, he may become as mighty as Akodo Toturi (Core Set, 79), and even if he should fail, the Tireless Sōdan Senzo is always willing to enter another conflict, even if it is only with his own strength. Throughout the Elemental Cycle, the Mantis have made their presence known to the Great Clans. Demanding a place at the table, the Mantis Clan have received several neutral cards to further their cause. In The Ebb and Flow, their Champion, the notorious Yoritomo (The Ebb and Flow, 70) joins the fight! Yoritomo is a five-fate Champion with three military skill and three political skill. While this may not be as impressive as other Champions, Yoritomo is enhanced by the resources around him. For every fate in your fate pool, Yoritomo's military skill and political skill will increase! At the start of your turn, if you claim the traditional seven fate, Yoritomo becomes massively powerful, with ten military skill and ten political skill. Of course, you’re likely to spend this fate throughout your turn, lowering Yoritomo’s effectiveness. Luckily, with the support of the Mantis Clan, the Son of Storms' strength can be fully revealed. 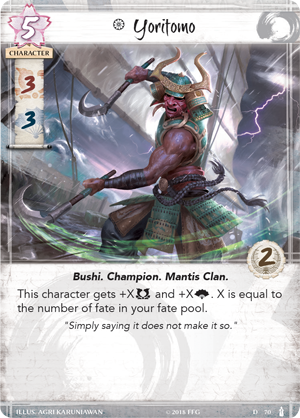 It is a rarity for a card in Legend of the Five Rings: The Card Game to grant extra fate, but the Mantis excel in it, and now every additional fate you keep serves as a boost to the Champion of the clan. For example, Kudaka (Breath of the Kami, 13) can allow you to collect even more fate, feeding into the strength of Yoritomo. With the full strength of his clan behind him, little can stand in the way of the Son of Storms. Water is flexible, ever-moving, and this adaptability is essential to surviving in Rokugan. 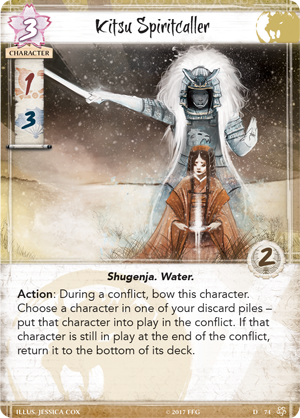 But when the calm river transforms into an overwhelming storm, will Rokugan still stand? 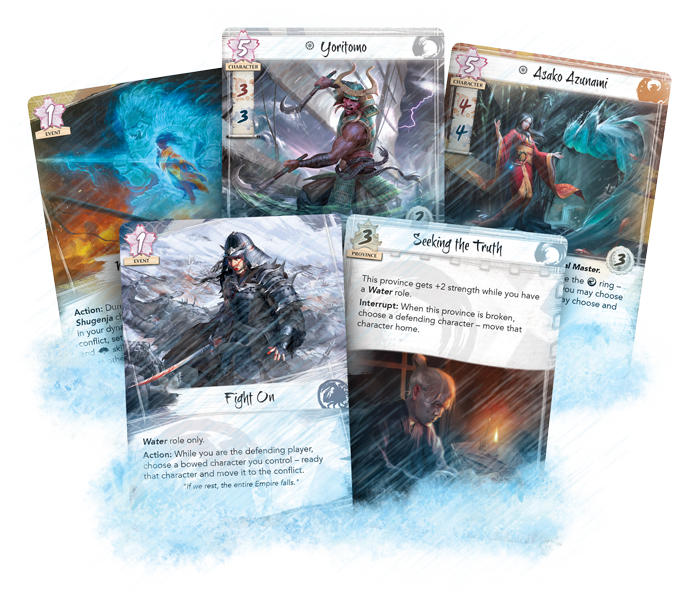 Join us next week as we preview the fifth Dynasty Pack in the Elemental Cycle, All and Nothing. As next Wednesday is an American holiday, look for the preview on Tuesday, July 3! Become like the river and pre-order The Ebb and Flow (L5C12) from your local retailer or our website today!